“Morning Sacrifice” was performed on Thursday 25, Friday 26, Saturday 27 Oct 1951, at the Theatre Royal. As its contribution to local Jubilee celebrations, Townsville Theatrical Society will have as Its next presentation a prize-winning Australian play. 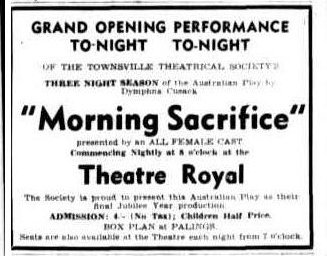 By well - known Australian authoress, the play is 'Morning Sacrifice' which in 1942 won a Drama Festival prize in Western Australia. Casting has been completed, with Mrs. L. Mills as Miss Woods, Mrs. M. Furse as Miss Portia Kingsbury, Mrs. M. Mercer as Mrs. Macneil, Miss M. Walsh as Miss Margaret Sole, Miss J. Coxon as Miss Gwyn Carivithen, Miss M. Green as Miss Sheila Ray, Miss Pountney as Miss Dora Pearl, Mrs. G. Hoye as Miss Charlotte Bates, and Mrs. J. Gallagher as Miss Rose Hammond. Scene of the play is the staff room of the Easthaven Girls High School. Production will be by Bill Wynn and presentation will be made late in October. Two of the principals in the Society's current presentation 'Gaslight' had more than 100 miles to travel for each performance and each rehearsal. They are Dan and Isabel Fitzpatrick who live at a Haughton Valley cattle property. For their parts of Jack and Bella Manningham in the Patrick Hamilton thriller, they motor 63 miles to Townsville for each performance, and return at night at the completion. 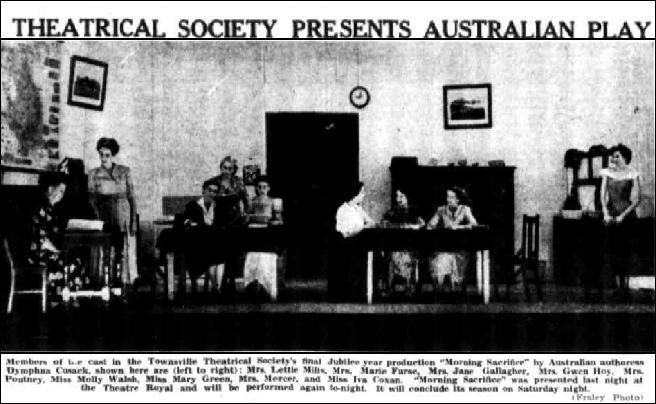 Opening a three-night season of an Australian III Act play as their final Jubilee Year production, at the Theatre Royal, on Thursday night, the all female cast of the Townsville Theatrical Society dis¬played considerable dramatic resourcefulness in their presentation of Dymphna Cusack's "Morning Sacrifice." The discordant atmosphere pre¬vailing in the staff-room of the "Easthaven" Girls’ High School was successfully captured from the first scene, and was admirably held together by Mattie Mercer. As Mrs. MacNeil, she sustained the character of the play until the nature of the divisions became evident in the subtle manner in which the deputy headmistress (Marie Furse) was grooming herself to take an ageing senior's place. Although the play had a tendency to ramble, the story; was unfolded very neatly by Gwen Hoye's characterization of Miss Bates as the "Tittle Tattle" and the uninhibited outbursts of Iva Coxon, who played Miss Carwither. Genuine feeling was drawn from the white-lostness of Mary Green, as Miss Ray, whose romantic nature was sympathetically dis¬closed. Thwarted by Miss Ray's senti¬mental feeling towards the girl who is about to be expelled from the school for kissing in the dark, Marie Furse, playing the scheming Miss Kingsbury, played her dominating role most convincingly. Even tempered and prim, Molly Walsh, who as Miss Sole, seemed always to hover between the opposing sets in the staff room and Jane Callagher, as Miss Hammond held the officious "cats" in her little set together as the heavy mannered martinet, while Beth Pountney portrayed the colourless Miss Pearl most effectively. Lettie Mills materialised the difficult background character of Miss Woods, the tottering power at "Easthaven" with an abstract idealism which put finish to the final scenes. The production is by Bill Wynn, assisted by Eric Rees. Stage manager John Eckersley.